Imagine a bottom of a barrel. Then imagine the bottom of the deepest hairline crack at said bottom of barrel--there resides Saturn Productions Inc. In the great pantheon of cheapie distributors to gradually flood the market at the tail end of VHS's reign, Saturn's suckage is equal to the circumference of their planetary namesake. Obscure Kung-fu programmers were their primary output, but they did trade in some mostly not-too-difficult-to-find horror and cult offerings. This tape of Ruggero Deodato's grandfather of cannibal flicks, Jungle Holocaust, is one of their rarest (or at least most desirable/valued) of their catalog. In reality, it's not really all that and can be found easily in spite of some eBay sellers portraying it otherwise. Saturn did something sneaky here. Instead of designing their own usual tacky $1.50 worth of artwork, the cover and transfer is completely ripped from the British pre-cert tape from Derann AV. 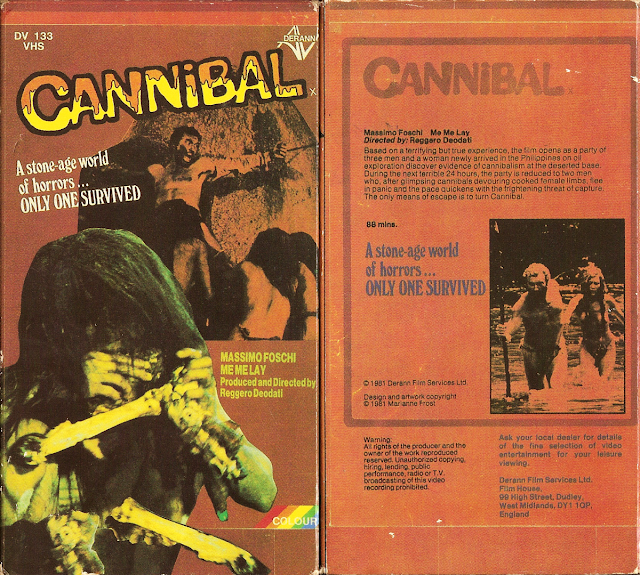 Unfortunately, "Cannibal" (BBFC listing here) was released on video by the company with the edited "X" cinema rating even being released before the U.K. required BBFC ratings by law in 1984. This NTSC tape retains those cuts (and BBFC rating screen), so it's certainly not worth tracking down as a means of viewing the feature. Not to mention the piss poor EP-speed playback quality that seems perpetually half-a-millimeter away from slipping off the VCR drum to create a magnetic tape rat's nest in your deck. Spend the extra time and cash to track down Video City Productions's clamshell. Now that's one badass release. I can account for its rarity, of all the Saturn tapes I would see repeatedly (CUTTHROATS NINE being one), I only found this one once and snagged it. Pretty worthless otherwise, I love the BBFC X cert. at the beginning, and as a piece of collectible trash in general, it's fun to have.